When "Star Trek Beyond" hits movie screens this week, it will play before one of the most engaged fandoms in the world. Trekkies will debate every angle of the film: whether it is too flashy for its philosophical routes, or if the new crew's adventures can stand on their own against those portrayed in the TV show that started it all. There's something about this franchise that inspires people in a way that few other fictional realms can; it impacts people when they watch it in childhood but can continue to have an effect on adults. I'm one of those folks. My parents didn't have cable when I was a kid, so I couldn't watch the TV shows. But I did watch the "Star Trek" movies. And when "Star Trek: Voyager" finally reached a noncable Canadian channel in the '90s, I tuned in every week. Space.com contributor Elizabeth Howell sits in a captain's chair on a replica bridge from 'Star Trek: The Next Generation.' The chair is part of a touring exhibit called The Starfleet Academy Experience, which Howell saw in Ottawa, Ontario in May, 2016. Lifelong devotion to the franchise was enough to land superfan James Cawley a cameo in the 2009 "Star Trek" movie. That's in no small part due to his own amateur Trek films, and his painstaking project to reconstruct the set from the original "Star Trek" series, right down to the 1960s film equipment. It's on display now in Ticonderoga, New York, about 250 miles (400 kilometers) north of New York City. When asked how much it cost, Cawley joked in an interview with Space.com, "I stopped keeping track seven years ago, when it reached $200,000." Cawley acquired the set blueprints in 1997 through the will of "Star Trek" costume designer William Ware Theiss, who was such good friends with Cawley that he let the superfan make some costumes for "The Next Generation." These included Wesley's infamous sweaters. So Cawley (who acquired a license from CBS Consumer Products) started to build the perfect set to honor the Enterprise, which, to him, is as much of a character on the show as Kirk, Spock or any of the crewmembers running around the famed ship. First, Cawley stored the pieces in an old car dealership. When that got full, he rented out an abandoned dollar store. Now, the recreated set is 13,500 square feet (1,250 square meters) of awesomeness, and includes every linear foot of the ship's decks. The transporter room, the bridge, the ready room, the sick bay — it's all there. Adult fans have been known to cry when they see the reconstructed set, Cawley reported to Space.com. He'll keep adding to it as time and money permit. Although the new "Star Trek" film could bring more fans through his doors, Cawley said he is skeptical about the vision put forth by J.J. Abrams, director of 2013's "Star Trek Into Darkness" and a producer on the new "Star Trek Beyond." Whereas all of the earlier TV series had a background of optimism from "Star Trek" creator Gene Roddenberry, Cawley said, the new films have jettisoned that in favor of an alternate, darker timeline. Although the series has done well in theaters, the change created disharmony, he said. Then, there are the superfans who have made a career out of sharing their passion with other "Star Trek" fans. That is the case with Denise and Mike Okuda, the husband-wife team who together have worked on several "Star Trek" television series and films, principally in graphic design and video editing. I saw a replica of the bridge from the TV series "Star Trek: The Next Generation," in Ottawa, Ontario, this year as part of the Starfleet Academy Experience touring museum exhibit. It was based on the TNG bridge on which Mike Okuda worked as a graphic designer. One of the guides on-site pointed out jokes in the panels. I could see there were fragments of many of the actors' names on the controls, as well as Gene Roddenberry's. I asked Mike about that. Yes, he was the one who put in the jokes. Mike — who worked on every "Star Trek" TV series between "The Next Generation" (or "TNG," for short) and "Star Trek: Enterprise" — grew up watching the original series and first got involved in the franchise with "Star Trek IV: The Voyage Home." He said there have been a lot of changes in optical effects over the years. "TNG" had motion-control photography and post-production video editing; but by the time "Star Trek: Enterprise" ran, the standard was high-definition video. Storytelling arcs became more complex in later series, too. While the original series could be watched in any order, TNG had some recurring elements. "Deep Space 9" required more dedication from viewers in order to understand the plight of the Cardassians, a fictional race of aliens, Mike Okuda said. "It's an extraordinary amount of fun … to have a chance to play in that sandbox. It's more fun than you can imagine," he said when I asked him about getting to be a fan and a creator at the same time. But when you're actually working, he added, "you're using the sources in your imagination, and you have to put aside being a fan. You [instead] say what are the most effective, most appropriate solutions to this storytelling problem that put the most value on the screen within the constraints of time and budget and artistic vision." The technology gap has posed some challenges as the Okudas worked with CBS to remaster TNG in high definition for Blu-ray releases. "A lot of people wanted to jazz up the effects," Denise Okuda said. However, although Mike wanted to change some of the work, they agreed to only do slight changes to maintain "what you saw in your living room in the 1980s," she added. Although the Okudas are not involved with the new films, they are finishing up work for an updated version of their "The Star Trek Encyclopedia" (1999), which will be re-released in October. Among the changes is the addition of the alternate timeline of the two newest films, which they decided to call the Kelvin Timeline in honor of the USS Kelvin in "Star Trek" (2009). Denise Okuda also has seen renewed interest in the franchise reflected in young people at comic-book and science-fiction conventions; these younger fans did not see the original series back when it aired live but are still able to appreciate it. "We're noticing younger folks that did not watch the original series, but they're dressing up in original-series uniforms — not necessarily the [style of the new] feature films," she said. I've been to the Smithsonian National Air and Space Museum in Washington, D.C., four times since 2003. The first time was to gape at the Enterprise space shuttle, which was named after the central ship from the "Star Trek" universe. The shuttle was finally unveiled after years in storage, at the Air and Space Museum's Udvar-Hazy Center in Fairfax County, Virginia. The facility was barely open, with temporary exhibits all over the place. But that space shuttle shone amid the construction. Meanwhile, the 11-foot (3.4 m) set model of the USS Enterprise that was used for shots of the ship's exterior in the show was in less glamorous quarters, in the gift shop in the basement of the museum's Washington, D.C., center. 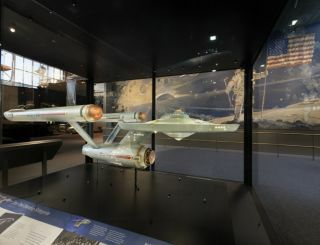 The museum's current curator, Margaret Weitekamp, first took responsibility for the USS Enterprise model in 2004 and vowed to move it once a great space became available. Twelve years later, the perfect spot is ready: a prime location by the back entrance. The Smithsonian was lucky to get the artifact in 1974, she told me. CBS saw "Star Trek" as just another canceled show and happily gave it over to the museum. In fact, "Star Trek" was continued past its first season in part because the museum asked for an episode to add to its archives, Weitekamp said. The model first appeared in an exhibit called "Life in the Universe?" and voyaged around different exhibits (and storage) until its most recent restoration between 2014 and 2016. Weitekamp was asked to duplicate the course content when she took a women's studies professorship at Hobart and William Smith Colleges in Geneva, New York. When the Smithsonian position opened up, she said with a laugh, "I had some actual professional credentials in 'Star Trek.'" "Star Trek" fans have seen periods of drought, Weitekamp said — such as the gap between the original series and TNG, and the period following the cancellation of "Star Trek: Enterprise" in 2005 that marked the last time a "Star Trek" series was on syndicated television. But from her perspective, fans have been incredible in keeping the spirit alive, by attending "Star Trek" conventions and signing up for newsletters. Marketers have even tried using "Star Trek" fandom to their advantage. For example, when "Star Trek: Voyager" began airing on U.S. television, it was available only on an obscure cable channel called the United Paramount Network; the network hoped the franchise's loyal fans would subscribe to the channel in order to see the show. Weitekamp sees the same happening for the new "Star Trek" television show on CBS, which (for now) will be available only through the network's online streaming service. "This fan community is very powerful, and very loyal," Weitekamp said. The "Star Trek" universe spans 5 decades, across multiple movies and TV shows. Recently, I interviewed Adam Nimoy — son of Leonard Nimoy, better known as Spock — for a different article. I enjoyed telling him about the signed T-shirt I have from his dad. I ordered the shirt after the elder Nimoy left the convention circuit due to a respiratory illness that eventually led to his death. Though Leonard Nimoy was ill at the time, he acted in the "Star Trek" reboot films in 2009 and 2013, and became close friends with Zachary Quinto, the actor who played Spock in the new films. As a kid, Adam Nimoy was not impressed by his father's cult status. "The celebrity got to be a little challenging for us as a family, and when the show went off the air, I forgot about it and distanced myself from the experience, and got to college and did my own thing," he told me in March. But when Adam got older and reconciled with his dad, a new project honoring Leonard Nimoy was born. Called "For the Love of Spock," the film will be released this year. Adam has been busy promoting his film in conjunction with the 50th anniversary of the franchise and events for "Star Trek Beyond." I have met all of the starring captains from all of the "Star Trek" TV shows and movies (except for Chris Pine, who plays Kirk in the new films) at conventions over the years. The best encounter was with Patrick Stewart, who played Capt. Picard on TNG and was signing autographs for a long line of fans when I saw him in Calgary, Alberta, in 2012. "Thanks for all your time with us," I said to him as he whipped out a signature for me. "I love my job," he barked in the tones of Capt. Jean-Luc Picard, in command on the bridge.